TLT's - Taylor ham, lettuce and tomato on toasted english muffins for dinner. Lasagna, garlic bread and salads. Deli Pastrami, Baby Swiss, Reuben style on Rye. Maultaschen. The radiused cutting edge in front of the bolster on my boning knife, which is maligned by some of our knife experts, was helpful in boning out the remnants of our roast fresh ham. I had to do service at the Ochopee FD, which is in Everglades City. So I hit Grimms Stone Crabs for what will probably be the last claws of this season for us. The menu will be conch fritters and crab claws. Only if "L" stands for lobster! 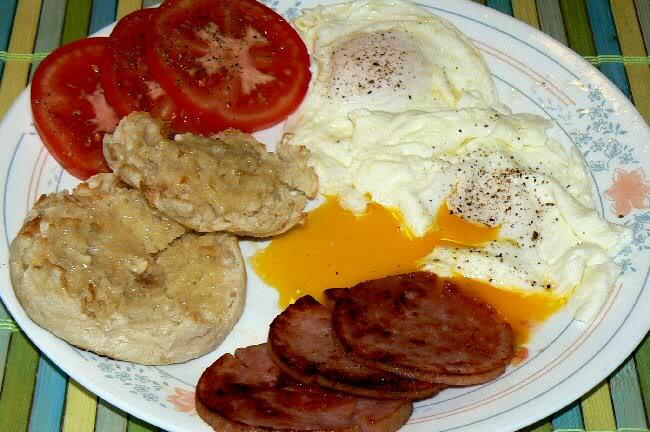 Breakfast – Over easy eggs (nice runny yolks), Taylor ham (pork roll nicely browned) and toasted and buttered English muffin. I was thinking about a bacon, lettuce, egg, tomato and cheese. bletch.